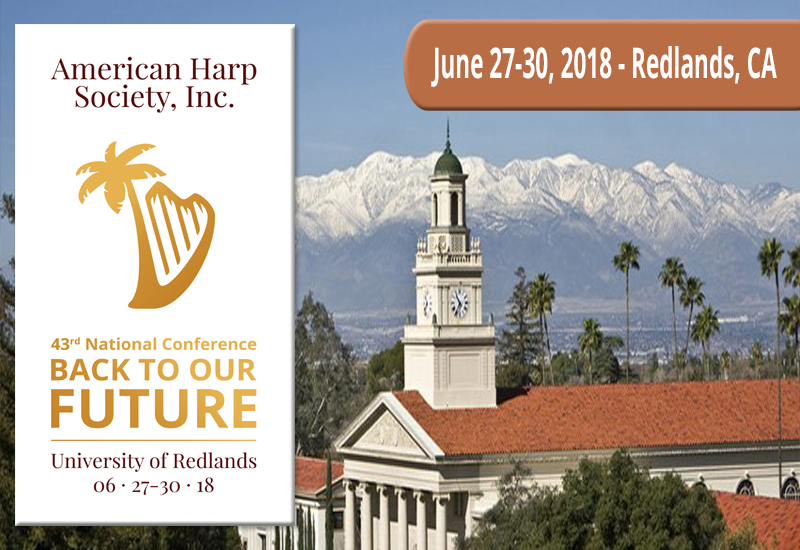 The American Harp Society, Inc. and the Inland Valley Chapter look forward to welcoming you to the University of Redlands for “Back to Our Future”! Programming spotlights the three tenets of the AHS mission statement: celebrating our legacy, inspiring excellence, and empowering the next generation of harpists. It will also reflect the Latin influences of southern California and as well as the Hollywood musical scene. Please scroll through and read this entire introduction before registering, it contains a great deal of important information. Anyone wishing to attend daytime events and concert receptions must register, and must be a member of the American Harp Society, Inc. The registration fee and one-day passes include admittance to the exhibit hall, workshops, daytime and evening concerts, and receptions. A conference badge will admit all registrants to each event and must be worn at all times. All fees are non-refundable. Non-registered guests wishing to attend evening events June 27-29, 2018 may purchase tickets at the door for $25.00, or during this online registration process by a registered member. Please note that registration fees do not include the Chapter Officers and Executive Luncheon, which is available during registration in Meal Plans, on site or online (www.ahsconference.org). After selecting all registrations, you will see "Assign Ticket" buttons, in order to identify each person who is being registered. For any Non-harpist Family Member registration purchased, when making assignments please select "non-member" (rather than "This is my ticket") to open a form and enter the name and details for that family member. All other registrations MUST be assigned to an AHS member, or they will be invalidated. Two free harp ensemble experiences will be available to anyone interested in participating. Chose the “Youth & Adult Harp Ensemble Sign Up” registration (the fourth item on the registration page, after Adult, Student, and Non-harpist Family Member) to learn more and register. There is no fee, but participants must register, purchase music (to be announced shortly) and provide their own instrument. Details are also available on the Conference website. Metropolitan Opera principal harpist Emmanual Ceysson is offering a masterclass for five select students on Thursday, June 28th. A separate online application, including the uploading of a recording of repertoire to be performed, is required. Students accepted to participate must also register for the National Conference, and pay a $50 masterclass fee before arrival. To learn more and apply for consideration, please visit the online application form. Special rates for AHS National Conference guests are available at three hotels: Ayres Hotel Redlands, Doubletree by Hilton San Bernardino, or Country Inn and Suites, Redlands (contact information is available on www.AHSConference.org). Guests must make hotel reservations directly with the Hotel and mention the “Harp Society Group”. Hotels are not within walking distance of the campus. Traditional dormitory rooms are available on campus within a short walk to all Conference and evening concert venues. Rooms include free parking and free wireless internet. Single occupancy rates are $33 per person per night, or double occupancy at $30 per person per night, plus a one-time $15 linen fee per bed. Within a ten minute walk are the Unversity's Brockton Avenue Apartments. Each four-bedroom, two-bath unit includes air conditioning, kitchen with garbage disposal, dishwasher, fridge, stove/oven, microwave (but no utensils) and living room. Private rooms with single beds are $35 per person per night, plus one-time $15 linen fee. Practicing in both facilities is allowed within reasonable hours (note: no elevators). On-campus housing and meals must be reserved no later than June 1, 2018. Dorm reservations are handled separately from this Conference registration by FOLLOWING THIS LINK TO RESERVE DORM ROOMS. Varied dining options are available on and near campus, including the University Commons Cafeteria. Although individual meals may be purchased, for the greatest convenience select the Conference meal plan. Gluten free, vegetarian, organic, and other dietary options are available - see menus and more at www.redlands.cafebonappetit.com. A Saturday closing luncheon is complimentary for all Conference registrants. Prices include tax. You may return to your registration form through the Member Portal ("Events", "My Events Registrations") to add meal plans and luncheon tickets, purchase a cookbook, register for the harp ensembles, etc., should you wish to make those decisions at a later time. Dorm rooms may also be added with this link.